Established in 1842 by Western Quarterly out of Fallowfield Monthly and New Garden Monthly. Initial component meetings were: Pennsgrove Preparative, Homeville Preparative, Homeville Indulged and Oxford Indulged. The meeting was discontinued in 1952. South Third St., Oxford, PA – Set up as an indulged meeting by Pennsgrove Monthly in 1876 and transferred to Nottingham Monthly in 1883, at which time it became a preparative meeting. The red stone meeting house was built in 1879. The preparative meeting was discontinued in 1927 and it became an indulged meeting again. In 1937, the property was deeded to Nottingham Monthly Meeting. The meeting house is now the home of Nottingham Monthly. Functioned as an indulged meeting under Fallowfield Monthly from 1828 known as Colerain. In 1839 it was established by Western Quarterly as a preparative meeting then known as Oxford. In 1842, the meeting was added to the newly formed Pennsgrove Monthly and became known as Homeville Preparative. Set up in 1829 by New Garden Monthly after having been an indulged meeting since 1820. Early meetings were held at the home of John Hambleton until March 1828 and than at the home of Samuel and Phebe Hadley for about 9 months. After that, meetings were held in a small log building on Hadley's land until the current meeting house was built in 1833 and its burial ground plotted. 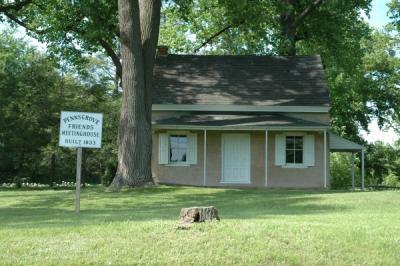 In 1842, the meeting was transferred to Pennsgrove Monthly. The meeting was laid down in 1951 and Pennsgrove Monthly assumed its responsibilities. The meeting house is open for special meetings each summer.